Team Suzuki Press Office – July 5. The hard-pack and dust of Uddevalla was another happy hunting ground for Suzuki as Rockstar Energy Suzuki World MXGP’s Kevin Strijbos rode to third position at the Grand Prix of Sweden for his third consecutive podium result and a repeat of his 2014 classification at the same event. The Belgian flew his works RM-Z450 to eighth and second places in two hot and sunny motos after setting off from Pole Position. Rockstar Energy Suzuki Europe’s Glenn Coldenhoff took eighth in his first outing at the circuit in two years while in MX2 Jeremy Seewer lifted his third trophy of the campaign with third overall. Slick, narrow and restrictive; Uddevalla – surrounded by 22,000 fans - provided its usual challenge and with good weather in the build-up to the Grand Prix, the hardened soil forged some tough ruts and slippery sections, accentuated by watering to try and contain the dust. Temperatures neared 30 degrees as the fans clambered over the adjacent rocky hillside for a bird’s eye view of the action. Strijbos launched strongly out of the stony gate for the first moto of 30 minutes and two-lap duration. Holding a top-three position he was pushed off the track in the second turn and the incident put him deep into the pack. Hurrying to regain positions he had a small crash and then embarked on a hard race to recover from 15th up to eighth place. The 29 year old reversed his luck in the second moto. Romain Febvre seized the holeshot but Strijbos turned tight in the first left hander and emerged with the lead. From that moment the pair broke away from the pack in a re-run of their dice on Saturday. Strijbos fended off the Frenchman for the majority of the dash but then could not respond to his rival’s block-pass with three laps to go until the finish. For Coldenhoff the Grand Prix marked the first time the Dutchman had sampled the (original) reversed trajectory of the circuit, having missed the 2014 event with a knee injury. He was again nursing a slightly weakened knee joint in Sweden but enjoyed a good start and consistent run to fifth position on Saturday. It meant a decent choice in the gate for the fast charge into the open first turn. The ‘#259’ slotted into the top-10 in the formative stages of the first race. He chased David Philippaerts and had an intense battle with the Italian. At one point he pushed up to seventh place but Philippaerts retaliated and then Strijbos also intervened and he passed the chequered flag in ninth. The second moto again saw some solid consistency as he chased Jeremy Van Horebeek and completed most of the sprint in sixth position for his best classification from the last six outings. Strijbos’ promising form since he returned from wrist and thumb problems has seen ‘#22’ accumulate a decent amount of points and he now sits 11th in the championship standings. Coldenhoff has been consistently in the top-10 and lies 10th. Rockstar Energy Suzuki World MXGP move straight onto round 12 of the championship next weekend and will travel to the site of the 2014 Motocross of Nations at Kegums for the Grand Prix of Latvia. Depending on his improving condition and strength from a damaged MCL in his left knee, Clement Desalle could be joining the team in the paddock for the first time in three events. MXGP Moto1: 1. Romain Febvre (FRA, Yamaha), 34:28.955; 2. Jeremy Van Horebeek (BEL, Yamaha), +0:14.107; 3. Shaun Simpson (GBR, KTM), +0:18.097; 4. Todd Waters (AUS, Husqvarna), +0:18.528; 5. Gautier Paulin (FRA, Honda), +0:20.159; 6. Dean Ferris (AUS, Husqvarna), +0:25.268; 7. David Philippaerts (ITA, Yamaha), +0:31.278; 8. Kevin Strijbos (BEL, Rockstar Energy Suzuki), +0:32.398; 9. Glenn Coldenhoff (NED, Rockstar Energy Suzuki), +0:35.198; 10. Christophe Charlier (FRA, Honda), +0:43.540. MXGP Moto2: 1. Romain Febvre (FRA, Yamaha), 35:12.538; 2. Kevin Strijbos (BEL, Rockstar Energy Suzuki), +0:01.295; 3. Antonio Cairoli (ITA, KTM), +0:31.708; 4. Dean Ferris (AUS, Husqvarna), +0:33.610; 5. Jeremy Van Horebeek (BEL, Yamaha), +0:40.109; 6. Glenn Coldenhoff (NED, Rockstar Energy Suzuki), +0:42.819; 7. Todd Waters (AUS, Husqvarna), +0:45.235; 8. Evgeny Bobryshev (RUS, Honda), +0:48.698; 9. David Philippaerts (ITA, Yamaha), +1:01.555; 10. Gautier Paulin (FRA, Honda), +1:01.775. MXGP Overall Result: 1. Romain Febvre (FRA, YAM), 50 points; 2. Jeremy Van Horebeek (BEL, YAM), 38 p.; 3. Kevin Strijbos (BEL, Rockstar Energy Suzuki), 35 p.; 4. Dean Ferris (AUS, HUS), 33 p.; 5. Todd Waters (AUS, HUS), 32 p.; 6. Shaun Simpson (GBR, KTM), 30 p.; 7. Antonio Cairoli (ITA, KTM), 28 p.; 8. Glenn Coldenhoff (NED, Rockstar Energy Suzuki), 27 p.; 9. Gautier Paulin (FRA, HON), 27 p.; 10. David Philippaerts (ITA, YAM), 26 p.
MXGP World Championship Standings (after 11 of 18 rounds): 1. Romain Febvre (FRA, YAM), 419 points; 2. Antonio Cairoli (ITA, KTM), 380 p.; 3. Maximilian Nagl (GER, HUS), 360 p.; 4. Gautier Paulin (FRA, HON), 351 p.; 5. Evgeny Bobryshev (RUS, HON), 319 p.; 6. 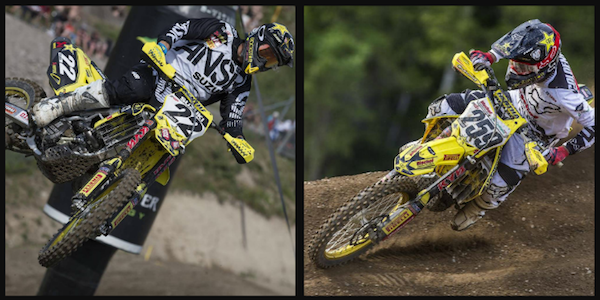 Clement Desalle (BEL, Rockstar Energy Suzuki), 291 p.; 7. Shaun Simpson (GBR, KTM), 257 p.; 8. Jeremy Van Horebeek (BEL, YAM), 232 p.; 9. Todd Waters (AUS, HUS), 224 p.; 10. Glenn Coldenhoff (NED, Rockstar Energy Suzuki), 196 p.; 11. Kevin Strijbos (BEL, Rockstar Energy Suzuki), 186 p.